Microsoft offers an "Ad-free" Outlook.com upgrade that also promises additional support. While the ads do disappear, the support is nowhere to be found. 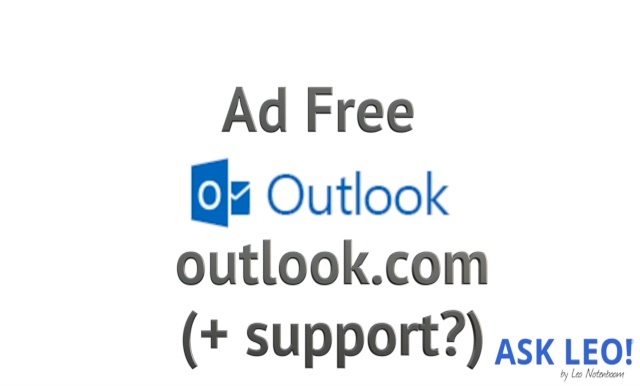 Continue Reading: Ad Free Outlook.com - With Support? Someone somewhere has gained access to their account and is using it to send spam. Sometimes passwords are changed, sometimes not. Sometimes traces are left, sometimes not. Sometimes everything in the account is erased – both contacts and saved email – and sometimes not. But the one thing all of these events share is that suddenly, people (usually those on your contact list) start getting email from "you" that you didn't send at all. The scenarios differ, but the problem is the same: a machine has been infected with spyware, a virus, or some other form of malware, and that machine's owner is having a tough time getting rid of it. And it often happens with anti-malware software installed that "should" have taken care of it before it got to this stage. Hopefully, that'll never be you. If it is, let's review the steps I recommend for removing malware and reducing the chances it'll happen again. How do I get rid of Edge and Cortana ? Setting up a network on a newly built computer. The term was probably developed by people (like me) who didn't want to keep writing out "viruses and spyware and adware and …" when writing about current internet threats. "But no one seems to have explained why it's better." - Whether or not somebody would find Windows 10 an improvement really depends on whether they'd use the features that it introduced - things like Continuum, Cortana and Task View. It should also be remembered that OS releases tend to be more evolutionary than revolutionary. Windows 10 was not enormously different to Windows 8, Windows 8 was not enormously different to Windows 7, Windows 7 was not....etc., etc. But if you compare Windows 10 to Windows 9x, it's pretty obvious that all the little evolutionary changes have contributed to an OS that's massively improved in terms of usability, functionality, security, automation and more. "'DANGEROUS'? Very overstated. When have the thousands (or is it millions) of Microsoft's 'Security Updates' protected anyone from anything?" Remarks such as this make me bristle (to borrow a phrase from Mr. Notenboom). XP is no longer a secure OS - and is, therefore, dangerous to use - and nobody with even a modicum of security knowledge would claim otherwise. End of story. If you use XP for everyday activities, you're putting your computer at risk, your data at risk, your identity at risk and your banks accounts at risk. If somebody chooses to accept those risks, that's obviously entirely up to them; but to encourage other people to assume the same risk by downplaying the dangers associated with using XP is completely irresponsible. Switch to Windows 7, 8 or 10, or Mac or Linux - whatever you want, so long as it's still supported - but don't keep on using XP. It isn't safe. If Win 10 is the final OS according to Microsoft, why can't the manufacturers of peripherals, such as printers and scanners, write a final, mature Win 10 driver for their old hardware? It should be the last time. I get a lot of donated equipment that still works fine, but I can't find drivers for them. (eg. Epson scanner yesterday). At an Apple II conference at a Kansas City College in the 90s someone had gotten ahold of a prototype Apple Ethernet card and overnight wrote a driver for it from scratch and was able to print to the printer in the College office using an Apple IIgs. Can't be that hard to upgrade an already written driver for the new OS. The Apple driver was, what, 20 years ago? WHen things were WAY simpler than they are now. Regardless of whether something called "Windows 10" is the final version of Windows, I can certainly envision future updates that impact drivers so that they need to be updated. Progress is progress, change is change, regardless of whether you give it a new name or not. I've not talked about design primarily because it's not my strength. That doesn't mean it isn't important, however, so let's talk about look, feel, and functionality. "But What Do I Write About?" So-called "writer's block" prevents a lot of people from creating content regularly. I'll give you some ideas on a virtually unlimited supply of ideas to write about. Read: "But What Do I Write About?"